Helping care for your cat’s teeth has never been easier or more delicious with Meow Mix Brushing Bites bursting with the tasty flavors your cat will love! These crunchy treats are specially designed to help keep your cats’ teeth clean by reducing plaque and tartar when fed daily. I love that you guys do this. 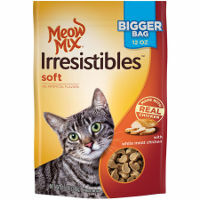 This is the only cat food my two cats will eat. Thanks ! !